I have been on a walking tour of OLD TOWN and the name gives it away. The city is treated as an artifact with a story to tell. This is told very well because the tour is well researched and the story given life by our volunteer guide, Henry Wykowski . There are gorgeous buildings and quirky aspects to them, bears in wall niches, grand staircases leading to timber homes perched on brick bases, and stories linking them to the introduction of the sewerage system. Our guide knows his city and its stories so well we hung on his every word. Walking tours, tours with strollers, tours with dogs (called pup tours as opposed to pub tours), train tours, just about every kind of tour becomes a part of the public program and this and most of the other outdoor activities are programed for summer as winter here is incredibly bitter. I also visited the Jane Adams Hull House Museum which is a beautiful old home and once the focal point of large institutional buildings that surrounded it (now demolished) and provided homes and support to the burgeoning immigrant population. Here I talked to Lisa Junkin Lope the interim director about the challenges of telling a story that now includes telling more about Jane Adams and her relationships with the two women who worked with her on the projects. Was she gay or not? Is this important to the story? If so in what ways is it important? One of the things I wanted to explore is how we tell difficult stories and what constraints do we operate under when we try to do this. One response from the house museum was to allow multiple labels to be written. One by the curator and others by the public. Interesting. 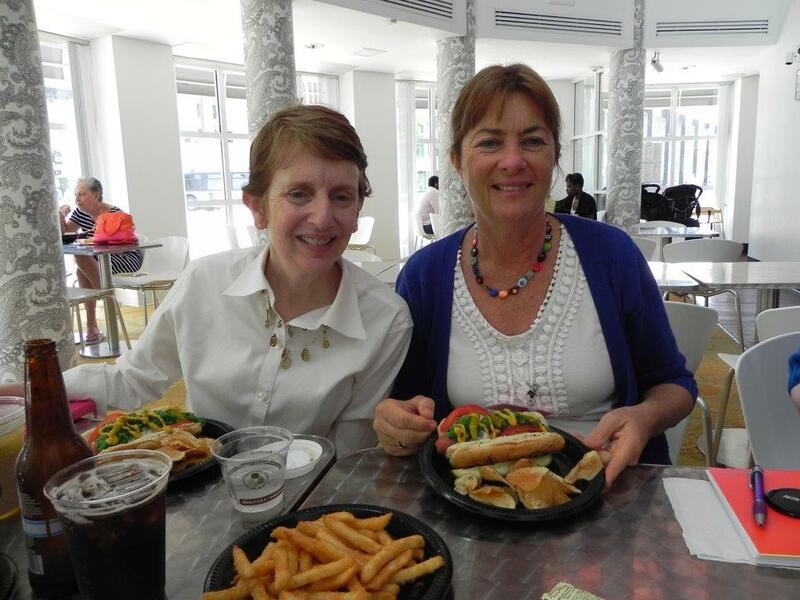 Lynn McRainey and me (on right) about to hoe into a Chicago hot dog. 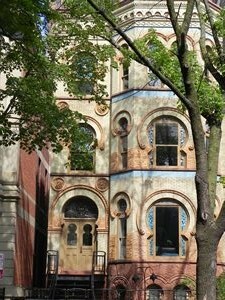 A house on the Chicago Tour. 1 Response to "Lesley Jenkins blogs from Chicago"
Glad to catch up with your blog Lesley. Your work in Chicago sounds most impressive, although those Chicago hot dogs look dangerous!